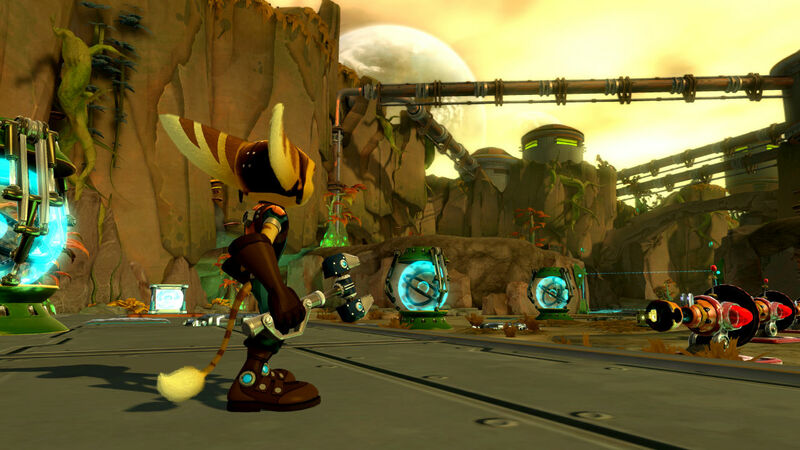 In the ten years the Ratchet & Clank series has been around for, developer Insomniac perfected its formula. With the series distilled to an exact science, where do they go next? How do they keep the series fresh? The answer: tower-defense. 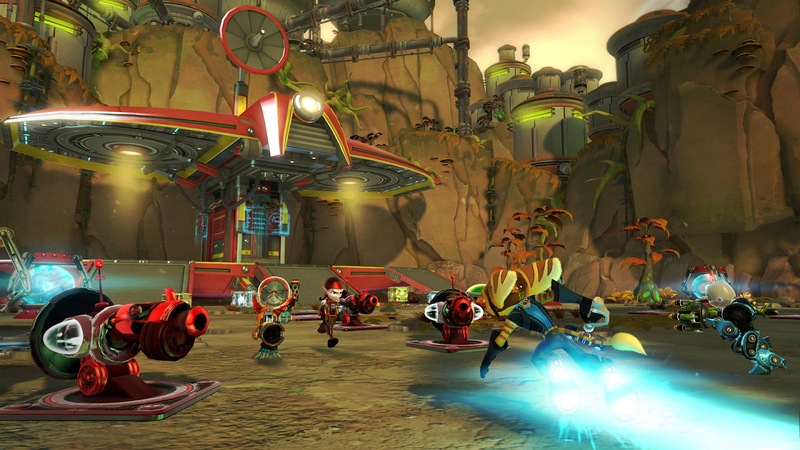 Ratchet & Clank: Full Frontal Assault is a multiplayer-centric entry in lieu of 2005’s Ratchet: Deadlocked. Multiplayer is the main attraction, its single-player campaign a shallow bundle of levels that act primarily as an extended training mode. Competitive play is thrilling and well-executed, but if the desolate state of the community is any indication, this game’s got a short life ahead of it. Charging toward that with only a wrench in hand might not be the best idea, FYI. Full Frontal Assault is equal parts tower-defense and tower-assault. The campaign serves to introduce you to the game’s concepts, its five brief stages providing little in the way of entertainment. The story goes that a new villain by the name of Zurgo is terrorizing a small quadrant of the galaxy by disrupting the planetary defense systems installed on each planet in the area. Ratchet, Clank, and Quark, having received the notice from Zurgo himself, reinstate the “Q Force” as a result, quickly deploying onto the scene. Since the tale is so short, there’s zero development, let alone any story beats. A handful of brief cutscenes move the plot along hastily, wasting no time in trying to flesh anything or anyone out. Zurgo is as boring a character and villain as they come. He’s basically the stereotypical Internet nerd, talking endlessly about how “leet” he is, mentioning his blog constantly, lives in his mom’s basement, etc. The humor, unfortunately, also relies on that same lazy source, Zurgo relegated to being the comic relief in the process. None of it is funny in the least, thus robbing the series of one of its trademark elements. The gameplay itself sees you defending your base – a spacious arena populated by pads designating where turrets and mines can be installed for a price – and the six generators line the walls of the area from attacking foes. Lose the generators, and you lose the mission. You also have to move beyond the base to capture key nodes to unlock the planetary defense center, which acts as the enemy’s stronghold. The game is split into two parts. The first is recon/assault: in which you venture outside your base to gather weapons from dispensaries and bolts from boxes so that you can buy turrets, mines, and other armaments to keep the enemy at bay while also making sure to lay waste to their encampments. The second is defense: in which you periodically fight off small waves foes that are dropped just outside your complex, eventually culminating in a large-scale assault at the end of the level. Pyro-turrets aren’t going to do any good this far into the base. On paper, the idea is solid. Forcing the player to venture outside the confines of their base to gather bolts whilst also returning to help fend off the horde presents a nice, challenging balancing act. In execution, however, it comes off as a multitasking nightmare. In the first couple stages, the game keeps up a steady, fair challenge. Dropships arrive frequently to attack your base, but you’re given enough bolts and time to work with that you almost never have to worry about lacking the funds to keep your base fortified nor the time to return to help fend off the attack. By the time the third stage rolls around, however, the game receives a sudden jump in difficulty. Within minutes of starting, kamikaze bombers come charging in. After that, a tank. Just as the match begins, and you have next to zero resources or weapons to fight it. With only four minutes until its arrival, I quickly gathered bolts to build what I hopped would be an effective defense. Couple of rocket launching turrets and some chrono-mines (they slow enemies down to a crawl upon activation) were all I could afford in the measly amount of time given to prepare. To no surprise, it wasn’t enough. Tanks are well armored, so the only have any hope of defeating one without it completely decimating your defenses is by getting the jump on it; something that isn’t remotely possible when you first encounter it. The problems persist. In the level after, tanks, airships, and other power foes attack at an alarmingly high rate. During the end-of-level assault, three tanks arrive at roughly the same time. I was nearly out of ammo and almost all of the turrets had been demolished. The bolts being dropped by fallen foes wasn’t enough purchase new ones because the only effective turrets cost an exorbitant amount of bolts. The game is clearly shifted in favor of the AI, luck being the only factor in success when playing alone. That moment was emblematic of two things: (1) that this game is most assuredly meant to be played cooperatively, as the only reason I finished that fourth level was because I had a partner. Had I been going at it solo, I probably would have been able to finish the level. And (2) that this is the best part of the entire game. Playing cooperatively makes it abundantly clear the game wasn’t meant to be played alone. As a pure tower-defense game, Full Frontal Assault is a blast. The chaos that erupts all around and the split-second choices that need to be made as turrets fall and barriers shatter is intoxicating. It’s a thrilling atmosphere to take in. Having another player by your side only adds to the fun as you two quickly try to provide backup and rebuild defenses. 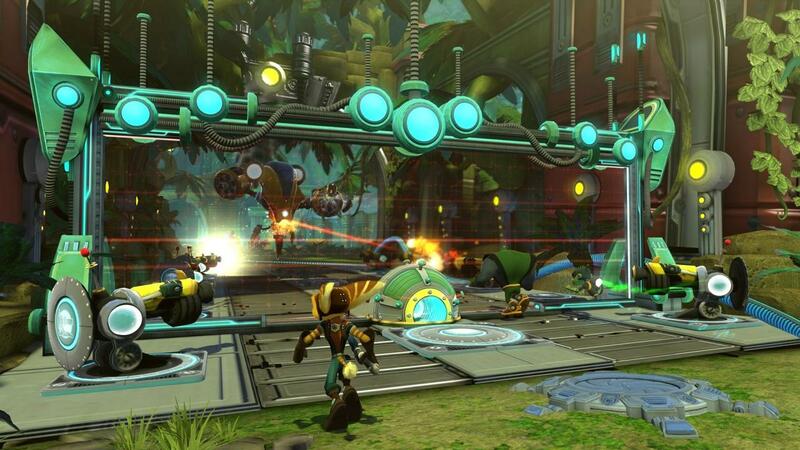 Racing about your base to meet the attackers and managing resources becomes less daunting a task in co-op. But even alone, the fierce action impresses. If the whole game were about that alone, with a few tweaks, the game would give the campaign some merit, short as it is. Bogging it down by forcing you to frequently run back and forth from the base only serves to interfere. All too often you’ll be en route to a key node – capture points that have to be taken before the planetary defense center opens – only to be notified of incoming dropships, thus prompting you to quickly turn around and protect the generators. What’s supposed to be challenge gives way to annoyance. Co-op remedies this by allowing you to divvy up responsibility, therefore letting one of you to continue gathering bolts while the other stays behind and places defense measures. You both share whatever bolts you collect, so it eases the stress of such herculean multitasking. But it doesn’t excuse the sloppy execution as a solo venture. That there’s no matchmaking for co-op, however – you can only play with people on your friends list or locally – is an extremely unfortunate omission. The only replay value that exists lies in medals to be earned for completing levels under certain conditions. For instance: within a particular amount of time or without losing any generators. Earning medals nets you promotions, which in turn grant perks like regenerating health and faster hover-boot movement. These only apply in the campaign. The competitive mode is a blast, assuming you can find an opponent. Multiplayer is the main reason to play Full Frontal Assault. The online plays the same as the single-player, making the campaign double as an extended tutorial of sorts. Mechanics that falter in solo-play, however, shine in competitive play. Balancing resource gathering, defending, and assaulting is much better here. The same principles from the single-player apply: the game is split into three phases – recon, squad, and assault. Each lasts anywhere from a half-a-minute to as much as three minutes. Recon sees you heading out to capture nodes that will supply you funds for the squad and assault phases. Squad is where you set turrets and conjure soldiers to attack the opposing players’ base, as well as purchase upgrades for yourself, your minions, and the base itself. And assault, of course, is where all the fighting happens. I wasn’t able to play many matches, however. Spent a good deal of time waiting, but I always received a “no games found” message. Either I wasn’t playing at peak hours or the community is already dead. Whatever the case, it doesn’t bode well for the game’s future. Stranger still – all of the options for custom games are locked by default, which defeats the whole purpose of custom games in the first place. Only by obtaining skill points – a sort of in-game achievement system – do they unlock. A total of three maps further damages the already limited offerings. The lack of a bustling community only a little more than a week after release (as of this writing) is especially damning. 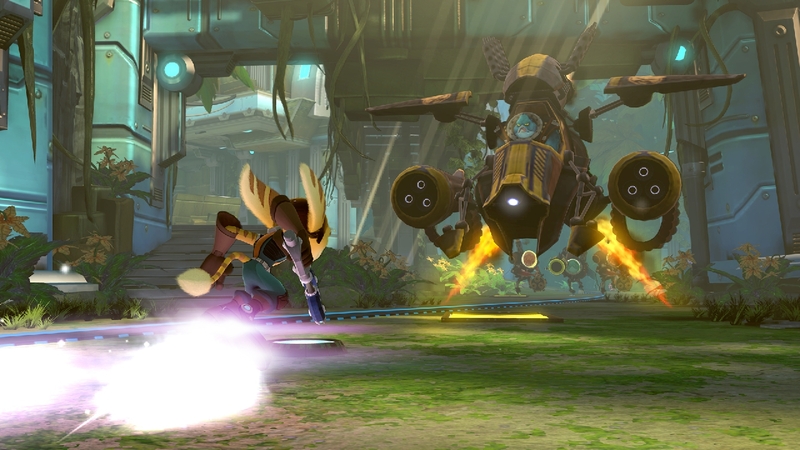 For a game that lives and dies on its multiplayer like Ratchet & Clank: Full Frontal Assault, it leaves the overall package very insubstantial, even at the low price of $20. Without a meaty single-player component to pick up the slack, Full Frontal Assault ultimately disappoints.